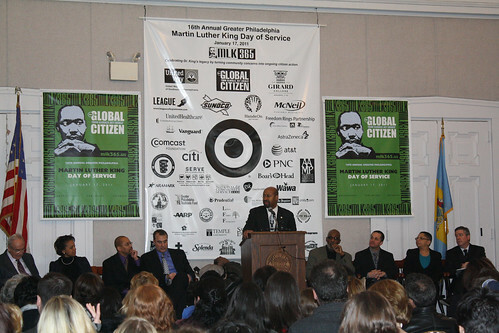 Mayor Michael Nutter speaks for the Martin Luther King Day of Service, 2011. (City of Philadelphia) Mayor Michael A. Nutter signed an executive order establishing the Mayor’s Office of Grants, which will increase the City’s capacity and capabilities to compete for federal, state and philanthropic grants as well as to manage the funding with transparency. New city-wide procedures will be instituted regarding the coordination, competition and application for grant funding, and the Office will regularly report on the effectiveness of grant-funded projects to both the funders and the public. The executive director of Mayor’s Office of Grants will be Maari Porter, formerly the Deputy Director of Finance for Recovery who oversaw the City’s distribution and management of American Recovery and Reinvestment Act (ARRA) funding. In Fiscal Year 2011, the City of Philadelphia was awarded $1.2 billion in grant funding from federal and state governments. Currently, the federal government is reforming its grant process to institute more competition and collaboration between counties and municipalities applying for funding. The Mayor’s Office of Grants will be tasked with responding to new allocation models by the federal government and with centralizing the application process. The Office will also work closely with the Chief Integrity Office to ensure compliance and monitoring of funding and reporting. Maari Porter led the City’s Recovery Office and set the strategic direction for the City’s stimulus program with the Mayor and Finance Director. She oversaw quarterly reporting and performance management of $278 million in 50 ARRA grants, ensuring transparency for taxpayers. Previously, Ms. Porter served as Capability Review Manager in the Office of the Cabinet Secretary for the United Kingdom and as a Performance Advisory in the Prime Minister’s Delivery Unit. She has a MSc from the London School of Economics and Bachelors in Urban Planning from the University of Auckland.